The 2017 Stockholm truck attack was an Islamist terrorist attack which took place on 7 April of that year in central Stockholm, the capital of Sweden. A hijacked truck was deliberately driven into crowds along Drottninggatan (Queen Street) before being crashed into an Åhléns department store. Five people were killed including an eleven year old girl and 14 others were seriously injured. The perpetrator was Rakhmat Akilov, a 39-year-old rejected asylum seeker and a citizen of Uzbekistan, who was apprehended several hours later. He had sworn allegiance to the Islamic State in a self-recorded video the day before the attack, and Uzbek authorities said he had allegedly joined the group. Akilov admitted carrying out the attack at a pre-trial hearing on 11 April. On 7 June 2018, Rakhmat Akilov was convicted of murder and terrorist crimes, and sentenced to life in prison (which, in Sweden, does not necessarily mean the rest of one's natural life; however, Akilov has to serve time until at least 2028) and lifetime expulsion from Sweden. Upon completion of his sentence, Akilov will be deported to Uzbekistan. Akilov chose to attack during an afternoon as there were many people and tourists in the area. Akilov recorded a number of films in the Odenplan area where he is heard saying that it is time to kill "infidels" and that it grieved him how Muslims in the Levant and Afghanistan were dying. The attack took place at about 14:53 local time. 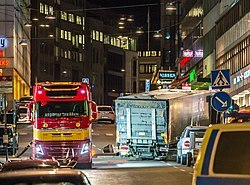 It began when a truck for the Spendrups brewery was hijacked while making a delivery on the street Adolf Fredriks kyrkogata in central Stockholm. According to a Spendrups press release, the driver attempted to stop the hijacker by standing in front of the truck, but had to jump out of the way and was slightly injured when the hijacker accelerated towards him. 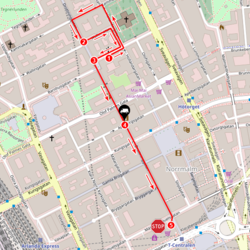 The hijacker then drove the truck at high speed into a pedestrian street, going about 500 metres (1,600 ft) down Drottninggatan, one of Stockholm's main shopping streets, hitting pedestrians along the way. Witnesses said the hijacker attempted to target children as he zigzagged on the street. The attack ended when the truck rammed the Åhléns City department store on the corner of Drottninggatan and Mäster Samuelsgatan. The truck caught fire, but the flames were quickly doused by firefighters. The hijacker jumped out and fled the scene. A homemade bomb was reportedly found in the truck after it was abandoned by the hijacker. Police sources said the device was found in a bag and had not been detonated, adding that the attacker had been burned by it. National Police Commissioner Dan Eliasson later said they had found a suspicious object in the driver's seat that "could be a bomb or an incendiary device", and was pending further investigation. The Parliament House and the metro system were locked down in response to the attack, and Stockholm Central Station was evacuated. All trains to and from Stockholm were put on hold, with traffic only resuming later in the evening. I wish today to first address you who grieve someone you've lost or worry for someone who is injured. You should know that all of Sweden is with you. We know that our enemies are these awful murderers – not one-another. King Carl XVI Gustaf, on behalf of the Royal Family, gave their condolences, stating, "Our hearts go out to the victims of this terrible tragedy, and to their families." Swedish media reported on those who chose to help the injured, especially medical doctors working nearby who ran to help those in need. Police from all over Stockholm were called in to assist after the attack. Swedish border controls were tightened following the attack, and travelers from other countries, including Nordic countries, were advised by police to bring their passports. However, the Swedish Security Service (Säpo) did not raise the risk assessment from "level 3" (on a scale of 1 to 5), the level it had been at since 2010. On the day of the attack, Norwegian police said officers in the country's largest cities and at Oslo Airport would be armed. The day after the attack, a man was arrested and part of the Grønland district of Oslo closed off by police after a "bomb-like" device was found, which was later destroyed in a controlled explosion. The man, a 17-year-old Russian citizen, was charged on 9 April with illegal possession of an explosive device. The man arrived with his family in Norway as an asylum seeker in 2010, and was known to the Norwegian Police Security Service (PST) for having expressed support for the Islamic State of Iraq and the Levant (ISIS). With his background from the Caucasus, the 17-year-old has been linked to two other young Chechen men from the same martial arts club in the northern village Vadsø who traveled to fight for ISIS in Syria. The events led PST to raise the terror alert, indicating that attempted attacks during the coming year are "likely". Police patrols were also increased in Finland's capital Helsinki. On 9 April, Swedish Prime Minister Stefan Löfven said the government intended to change immigration law to facilitate the removal of people whose applications to stay in Sweden have been rejected. On 9 April, more than forty thousand people gathered on Sergels torg (Sergel's Square) in Stockholm to honor the victims. Many people visited the site of the attack, leaving flowers and candles for the victims on Sergels Torg and on Drottninggatan, resulting in what was described as a "sea of flowers". Flowers were also left at Götaplatsen in Sweden's second-biggest city Gothenburg. After the attack, there were proposals in Aftonbladet—one of Sweden's biggest newspapers—that vehicles be banned from Stockholm city center so they cannot be used as weapons, citing the use of vehicles as terrorist weapons in Nice, Berlin, Jerusalem, London, and Stockholm. The department store Åhléns had planned to re-open two days after the attack, but received heavy criticism after saying they would be selling smoke-damaged clothing at reduced rates. Åhléns later chose to stay closed for one more day and not to sell any damaged clothing. The Swedish far-right was accused of trying to profit from the attack, producing fake news and circulating fake quotations online. This included tweets and social media posts from officials of the Sweden Democrats, a right-wing nationalist party. A man with a name similar to that of the main suspect was falsely implicated on the website Avpixlat. Following the attack, the social media website Facebook was criticized for not deleting images of badly wounded or dead victims. On 11 April, a Facebook spokesman said the website had begun deleting the images. Swedish authorities started cracking down on illegal immigrants in the country after the attack. In April 2019, the municipality of Stockholm organised an event to place a wreath to commemorate the anniversary of the attack. Families of the victims were not invited and were banned from attending the event which the municipality said was "private". The lights on the Eiffel Tower were switched off on the evening of the attack to mourn the deaths. Nice, a city which bore witness to a similar but deadlier attack in 2016, raised the Swedish flag at half-mast the day after the attack to show solidarity with the Swedish people. In Brussels, where a terrorist attack took place a year earlier, the ING Marnix building near the Throne metro station was also decorated with a moving Swedish flag animation. Responses by the heads of state or foreign ministers of several European countries were issued within hours of the attack. However, discussion among US news media and officials was dominated by the American missile strike in Syria, which happened the same day. Stéphane Dujarric, the Spokesperson for the Secretary-General of the United Nations, said, "Our sympathy goes to the families of the victims and all those affected and we wish the injured a prompt recovery. The United Nations stands in solidarity with the people and Government of Sweden". Pope Francis also said prayers for the victims of the attack. Danish government minister Inger Støjberg expressed concerns that at least 12,000 illegal immigrants were still living in Sweden after having their asylum applications rejected. She said that if satisfactory answers could not be given by the Swedish government, Denmark would consider implementing border checks on the Danish side of the border. The only border checks done in April 2017 were on the Swedish side. The attack is described as "driven by jihadist ideology" by Europol. Swedish police initially published pictures of a man wearing a hooded jacket, who they wanted to question over the attack. At 19:55 (17:55 UTC) on 7 April, Rakhmat Akilov, a 39-year-old construction worker from Uzbekistan, was apprehended in Märsta, north of Stockholm, suspected, on probable cause,[a] of "terrorist crimes through murder". The police said he had been found "behaving suspiciously with minor injuries" and was believed to have driven the truck. He was officially arrested at 01:15 on 8 April, and formally identified by the Swedish Prosecution Authority on 11 April. The Swedish Security Service (Säpo) was heavily involved in the investigation. In 2016, Säpo had received some information on the suspect, but were unable to confirm it when they followed up on it. They reportedly deemed him a "marginal figure" on the fringes of extremist groups. Akilov came from a Russian speaking family from a village outside Samarkand, currently in Uzbekistan. His older brother Olim Akilov stated in an interview with Swedish newspaper Aftonbladet that they considered themselves a "typical Soviet family", and he mentions that they did not welcome the collapse of the USSR. According to the brother, neither Rakhmat Akilov nor his children were ever religious, and Rakhmat didn't attend mosque in Russia or Uzbekistan or show signs of increased religiosity. Akilov moved to Russia in 2009 to work at the same cement factory outside Moscow as his older brother, which he did until 2013 when he lost this job. As stated by Akilov during police interrogation, in Tashkent he applied for a visa to Poland, after which travelled to Warsaw and then Gdansk, from where he took a ferry to Sweden. Akilov arrived in Sweden on 10 October 2014. He claimed asylum at the Swedish Migration Agency. The agency registered his application under the given fake name although his true identity was known and despite that according to the Dublin Regulation his application should have been handled in Poland, as he already had a visa there. Akilov stated he needed refuge from "the Uzbek security services which he claims tortured him and accused him of terrorism and treason". However, Sweden's Migration Board ruled that there was no evidence of this, and in late 2016, Akilov was ordered to leave Sweden within four weeks. When he failed to do so voluntarily and did not appear at the Swedish Migration Agency when called, the case was referred to the police; however, he went into hiding and could not be found for deportation. Reportedly, he lived at various addresses in Stockholm suburbs and was known as a hard worker, and a "normal Muslim" who visited the mosque on Fridays but got drunk on weekends and used cannabis. Shortly before the attack, Akilov was fired from his construction job, due to using drugs and sleeping while at work on dangerous construction sites with asbestos. On 9 April, Swedish police said Akilov had "expressed sympathy for extremist organizations, among them IS [Islamic State]". On 14 April, Uzbek Foreign Minister Abdulaziz Kamilov said that Akilov had joined ISIL after moving to Sweden, and had encouraged friends and family in Uzbekistan to fight for ISIL. Uzbekistan had opened an investigation and charged Akilov with participation in extremist, separatist and fundamentalist groups, as well as with making and distributing material that threatened public security. An Uzbek security source said Akilov had tried to travel to Syria in 2015 to join ISIL but was stopped at the Turkey-Syria border and sent back to Sweden. The source added that, two months before the attack, Uzbek authorities had put Akilov on a wanted list for those suspected of religious extremism. The Foreign Minister said that intelligence on Akilov had been "passed to one of our Western partners, so that the Swedish side could be informed". The Swedish Ministry for Foreign Affairs said it had not received such information. ISIS has not claimed responsibility for the attack, but experts note that the group tends not to do so if its members are arrested, as in the Stockholm attack. Akilov was registered at the same address as another person with links to financial crime. Initial suspicions of those involved sending money to ISIS could not be confirmed, though a number of people were convicted of false accounting and severe tax crimes. Early reports suggested Akilov had exchanged WhatsApp messages with a Chechen ISIL supporter just before and immediately after the attack. The authenticity of the chat was questioned, however. His former Facebook page reportedly linked to extremists and featured at least two ISIS propaganda videos. It has also been suggested that he had liked a Facebook page called "Friends of Libya and Syria", whose aim is to expose the "terrorism of the imperialistic financial capitals" of the United States, Britain, and Arab "dictatorships". During his time in prison, Akilov had made "Hitler salutes" and racially insulted personnel, leading to an investigation for racial agitation which was later dropped as the threats and insults were directed to specific individuals and not made public. Akilov has shown aggressive tendencies in prison, which requires him to be protected by four employees, including one armed. Akilov has supported the Islamist organisation Hizb-ut-Tahrir on Facebook. According to the prosecutor, Akilov's motive for carrying out the attack was to make the Swedish government cease its military training effort in Iraq. The public prosecutor successfully requested Akilov be remanded in custody during the preliminary investigation on 10 April 2017, pending a decision on prosecution. According to his lawyer, he "has expressed the explicit wish to be defended by a lawyer who is Sunni Muslim". His request was rejected by the Stockholm District Court. A pre-trial hearing was held at Stockholm District Court on 11 April, where his lawyer said he confessed to a terrorist crime and intends to plead guilty. A court-ordered psychological evaluation determined that Akilov did not suffer from any mental disorder at the time of the attack. The prosecutor indicted Akilov for terrorist crimes on 30 January 2018. Rakhmat Akilov was formally charged on 30 January 2018. The leading prosecutor in the case was Hans Ihrman, who submitted the indictment to the Stockholm District Court. On 7 June 2018, the court found Akilov guilty of terrorist crimes by five murders, attempted terrorist crimes by 119 counts of attempted murder and 24 counts of endangering others. He was sentenced to life in prison, and following his jail time he will be deported and banned from returning to Sweden. Akilov's public defender Johan Eriksson stated on 11 June 2018 that Akilov does not intend to appeal against his sentence. Akilov will be legally allowed to request a time-set prison sentence in 2028. If released, he would be deported to Uzbekistan. Akilov was imprisoned in Kumla Prison, a high security facility. In August 2018, he was assaulted by a fellow inmate who wanted vengeance for Akilov's terrorist attack. On 8 April, five other people were detained by police. Three of them were detained after a car, the owner of which was linked to the main suspect, was stopped on Kungsholmen. In the suburb of Vårberg, police raided an apartment where the main suspect was said to have been just hours before the attack; there, they detained at least two people. As of 10 April, all of them had been released from police custody. On 9 April, a second suspect was arrested on a lower level of suspicion of terrorist crimes through murder. The police confirmed apparent links between the second suspect and Rakhmat Akilov. On 11 April, the prosecutor revoked the arrest of the suspect. According to the prosecutor, the suspicions had weakened and there were therefore no grounds to apply for a detention order. The individual would however immediately be taken into police custody due to an earlier decision on expulsion from Sweden, as an application for legal residency in the country had been rejected. On 10 April, police said that the investigation could take about one year to complete. On 13 April, police said that they had held about 700 interrogations and made approximately 300 seizures during the preliminary investigation. On 23 April, another person was arrested for an undisclosed offense. Two days later, on 25 April, the arrest was revoked as the person was cleared of any involvement in the attack. Five people died as a result of the attack. Four of the victims who were killed at the scene or died in hospital shortly thereafter were identified as British Spotify executive Chris Bevington, 41, Belgian psychologist Maïlys Dereymaeker, 31, and Swedes Lena Wahlberg, 69, and Ebba Åkerlund, 11. 66-year-old Marie Kide, also Swedish, died in hospital three weeks after the attack. In a press release on the day of the attack, the Stockholm County Council said that 15 people were being treated in hospitals, nine for serious injuries. Ebba Åkerlund was interred in Stockholm. Since the end of 2017, a 59-year-old homeless man from Poland repeatedly vandalized her grave and others. He was arrested, charged with vandalism and released by Stockholm District Court until trial but did not show up for trial 8 March 2019. He was arrested again in April 2019 for the rescheduled trial in June 2019. ^ The highest level of suspicion for terror crime under current Swedish law. ^ "Gärningsmannens iskalla manöver med lastbilen vid attacken". Expressen (in Swedish). Archived from the original on 16 May 2017. Retrieved 13 April 2017. ^ "570 meter av ren skräck". DN.SE (in Swedish). 8 April 2017. Archived from the original on 9 April 2017. Retrieved 13 April 2017. ^ Andersson, Aron (10 April 2017). "Det här är lastbilsmodellen som användes i attacken – nu efterfrågas bättre säkerhet". Metro.se (in Swedish). Retrieved 6 September 2018. ^ "Woman injured in Stockholm attack dies in hospital". Sveriges Radio. Retrieved 28 April 2017. ^ Ekéus, Carolina. "Över tusen förhör i terrorutredning". Polisen.se (in Swedish). Retrieved 23 June 2017. ^ a b "Punkt för punkt – det här visar stämningsansökan mot Akilov". DN.SE (in Swedish). 30 January 2018. Retrieved 30 January 2018. ^ a b c "Uzbekistan says told West that Stockholm attack suspect was IS recruit". Reuters. 14 April 2017. Archived from the original on 4 May 2017. Retrieved 17 April 2017. ^ a b Jones, Evelyn (7 June 2018). "Stockholm terrorist Rakhmat Akilov sentenced to life in prison". Dagens Nyheter. Retrieved 7 June 2018. ^ Nyheter, SVT (20 February 2018). "Akilov om tidpunkten för dådet: Då är det mest turister". SVT Nyheter (in Swedish). Retrieved 26 February 2018. ^ Nyheter, SVT (14 February 2018). "Akilovs film strax före attacken: "Dags att döda de otrogna"". SVT Nyheter (in Swedish). Retrieved 26 February 2018. ^ "Tragedin i Stockholms city idag". Spendrups Bryggeri AB (in Swedish). Retrieved 9 April 2017. ^ Keyton, David; Olsen, Jan M. (7 April 2017). "4 killed in Stockholm truck attack described as terrorism". AP News. Archived from the original on 22 May 2017. Retrieved 7 April 2017. ^ "Briton among four killed in Stockholm terror attack". The Telegraph. Archived from the original on 9 April 2017. Retrieved 9 April 2017. ^ "Swedish store hit by truck regrets 'damaged goods' promotion". Associated Press. 9 April 2017. Archived from the original on 6 May 2017. Retrieved 9 April 2017. ^ a b "'Homemade bomb' found in lorry used in Stockholm attack". The Independent. 8 April 2017. Archived from the original on 22 May 2017. Retrieved 8 April 2017. ^ Masters, James; Sanchez, Ray (7 April 2017). "Stockholm truck attack kills 4; arrest made". CNN. Archived from the original on 16 April 2017. Retrieved 7 April 2017. ^ a b c "Four confirmed dead, one arrested over suspected terror attack". Sveriges Radio. Retrieved 7 April 2017. ^ "Löfven: "Våra fiender är de avskyvärda mördarna"". Omni (in Swedish). Archived from the original on 8 May 2017. Retrieved 9 April 2017. ^ TT. "Löfven: "Våra fiender är de avskyvärda mördarna"". Svenska Dagbladet (in Swedish). Retrieved 9 April 2017. ^ "Uttalande av H.M. Konungen med anledning av dagens händelse i Stockholm – Sveriges Kungahus". kungahuset.se (in Swedish). Retrieved 9 April 2017. ^ * "Läkaren: "Folk ställde verkligen upp"". Aftonbladet. Retrieved 9 April 2017. "Läkaren rusade från operationen mot Drottninggatan". DN.SE (in Swedish). 9 April 2017. Archived from the original on 9 April 2017. Retrieved 28 April 2017. Treijs, Erica. "Hjältarna under terrorattacken". SvD.se (in Swedish). Retrieved 28 April 2017. "Läkaren Louis hjälpte terrorattackens offer: "När jag kom hem blev jag väldigt rörd"". Expressen (in Swedish). Retrieved 28 April 2017. ^ TT. ""Väldigt känslosamt" att flytta blommorna". Svenska Dagbladet. Retrieved 9 April 2017. ^ Sundkvist, Frida. "Här är bilden som sprids över världen". Svenska Dagbladet. Retrieved 9 April 2017. ^ "Norwegian-Swedish border tightened after Stockholm attack". The Local. 8 April 2017. Archived from the original on 22 May 2017. ^ "Lastbil in i folkmassa – detta vet vi – DN.SE". Dagens Nyheter (in Swedish). 7 April 2017. Archived from the original on 9 April 2017. Retrieved 9 April 2017. ^ Anderson, Christina; Selsoe Sorensen, Martin (7 April 2017). "Stockholm Truck Attack Kills 4; Terrorism Is Suspected". The New York Times. Archived from the original on 19 April 2017. Retrieved 7 April 2017. ^ "Norway police destroy suspect device in Oslo". The Local. Agence France-Presse. 9 April 2017. Archived from the original on 22 May 2017. ^ a b "PST: Sannsynlig med terrorangrep i Norge de neste to månedene" (in Norwegian). NRK. 9 April 2017. ^ "Tre unge menn fra Vadsø koblet til ekstrem islam på tre år. Idrettsleder kritiserer kommunens integreringsarbeid". Aftenposten (in Norwegian). 10 April 2017. ^ Fouche, Gwaldys (7 April 2017). "Norway police to carry weapons at Oslo airport and main cities after Stockholm attack". Reuters. Archived from the original on 22 May 2017. Retrieved 8 April 2017. ^ Heba Habib; Griff Witte (9 April 2017). "Swedish police say Stockholm truck-attack suspect was failed Uzbek asylum-seeker". Washington Post. Retrieved 9 April 2017. ^ "Lovefest organizer: We wanted to repond to terror with love". Sveriges Radio. Archived from the original on 16 May 2017. Retrieved 14 April 2017. ^ "Så hedrar Sverige offren efter fredagens lastbilsattack". breakit.se. Retrieved 9 April 2017. ^ "Live-rapportering: Offren två svenskar, en britt och en belgare". hbl.fi. Archived from the original on 22 May 2017. Retrieved 9 April 2017. ^ "Här hedras offren för terrorattacken med ett hav av blommor". nyheter24.se. 9 April 2017. Retrieved 9 April 2017. ^ "Göteborgarna visade sitt stöd". Göteborgs-Posten. Retrieved 9 April 2017. ^ Franchell, Eva (10 April 2017). "Rensa Stockholm – stoppa bilarna". Aftonbladet (in Swedish). Archived from the original on 11 April 2017. Retrieved 13 April 2017. ^ "Åhléns ber om ursäkt – blir ingen rea – DN.SE". Dagens Nyheter. 9 April 2017. Archived from the original on 9 April 2017. Retrieved 9 April 2017. ^ a b "Så utnyttjas attacken i Stockholm för att sprida propaganda i sociala medier". DN.SE (in Swedish). 9 April 2017. Archived from the original on 9 April 2017. Retrieved 9 April 2017. ^ "Rustam, 38, hängdes ut som misstänkta 39-åringen – utan belägg". Metro (in Swedish). Archived from the original on 8 May 2017. Retrieved 9 April 2017. ^ "Facebook vägrar ta bort bild på dödsoffer". Aftonbladet (in Swedish). Archived from the original on 20 April 2017. Retrieved 12 April 2017. ^ "Facebook lovar radera foton på terrorns offer". Dagens Nyheter (in Swedish). Archived from the original on 13 April 2017. Retrieved 12 April 2017. ^ "Sweden intensifies crackdown on illegal immigrants". Dagens Nyheter. Retrieved 13 June 2017. ^ "Kransnedläggning för att hedra terroroffer – men anhöriga inte inbjudna – Nyheterna". www.tv4.se (in Swedish). Retrieved 7 April 2019. ^ Herreria, Carla (8 April 2017). "Eiffel Tower Goes Dark To Mourn Victims of Stockholm Attack". The Huffington Post. Archived from the original on 21 April 2017. Retrieved 9 April 2017. ^ "Svenska flaggan på halv stång i Nice". Aftonbladet (in Swedish). Retrieved 9 April 2017. ^ "Merkel: Våra tankar är hos befolkningen i Stockholm". Dagens industri. 7 April 2017. Archived from the original on 7 April 2017. Retrieved 9 April 2017. ^ "Statement attributable to the Spokesman for the Secretary-General on Attack in Stockholm, Sweden | United Nations Secretary-General". www.un.org. Retrieved 9 April 2017. ^ "Pope Francis: prayers for victims of Stockholm terror attack". Retrieved 9 April 2017. ^ "(da) Støjberg efter terrorangreb: Regeringen parat til grænsekontrol imod Sverige". Jyllands-Posten. 12 April 2017. Archived from the original on 13 April 2017. Retrieved 12 April 2017. ^ "EU Terrorism Situation and Trend Report". Europol. 20 June 2018. p. 25. ^ Anderson, Christina. "Stockholm Attack Suspect Will Plead Guilty, His Lawyer Says". The New York Times. Retrieved 12 April 2017. Mr. Akilov, a construction worker, had sought asylum in Sweden, but his application was rejected. ^ a b "Prosecutor asks court to remand Stockholm terror suspect in custody". The Local. 10 April 2017. Archived from the original on 23 May 2017. Retrieved 11 April 2017. ^ a b Foster, Peter; Boyle, Danny; Rothwell, James (8 April 2017). "Sweden truck attack suspect 'is 39-year-old from Uzbekistan who posted jihadist propaganda'". The Telegraph. Archived from the original on 8 April 2017. Retrieved 8 April 2017. ^ Anderson, Christina; Sorensen, Martin Selsoe (7 April 2017). "Stockholm Truck Attack Kills 4; Terrorism Is Suspected". The New York Times. ISSN 0362-4331. Archived from the original on 19 April 2017. Retrieved 8 April 2017. ^ "Sweden identifies truck attack suspect as 39-year-old Uzbek native". CBC News. Archived from the original on 29 April 2017. Retrieved 11 April 2017. ^ a b Anderson, Christina (10 April 2017). "Sweden Mourns Stockholm Attack Victims; Suspect Is Formally Identified". The New York Times. Retrieved 11 April 2017. ^ a b "Stockholm attack: Who is suspect Rakhmat Akilov?". BBC News. 10 April 2017. Archived from the original on 28 May 2017. Retrieved 11 April 2017. ^ "Akilovs bror i Uzbekistan: "Är det sant att han har erkänt?"". Aftonbladet (in Swedish). 26 April 2017. Retrieved 26 January 2018. ^ a b per.kudo@svd.se, Per Kudo |. "Akilovs asylfall skulle ha prövats i Polen". SvD.se (in Swedish). Retrieved 11 February 2018. ^ a b c Ahlander Johan, Yosufzai Mansoor; Niklas Pollard, Johannes Hellstrom; Simon Johnson; Philip O'Connor; Johan Sennero; Stine Jacobsen; Teis Jensen; Terje Solsvik; Mark Bendeich; Peter Graff (12 April 2017). "Stockholm attack puts a choke-hold on Swedish tolerance". Reuters. Archived from the original on 19 April 2017. Retrieved 15 April 2017. ^ Carlsson, Mattias; Delin, Mikael; Wierup, Lasse. "Rakhmat Akilov – övertygad islamist eller arbetslös missbrukare?". Dagens Nyheter (in Swedish). Archived from the original on 13 April 2017. Retrieved 13 April 2017. ^ Polisen. "Misstänkte gärningspersonen skulle utvisas". Polisen.se (in Swedish). Retrieved 9 April 2017. ^ a b Habib, Heba; Witte, Griff (9 April 2017). "Swedish police say Stockholm truck-attack suspect was failed Uzbek asylum-seeker". The Washington Post. Archived from the original on 9 April 2017. Retrieved 10 April 2017. ^ "Exklusiv intervju med Rakhmat Akilovs bror: "Han ska dömas till livstid"". Expressen (in Swedish). Retrieved 29 January 2018. ^ "Nu åtalas Rakhmat Akilov – så tappade han kontrollen inför terrorattacken i Stockholm". Expressen (in Swedish). Retrieved 29 January 2018. ^ "Stockholm truck attack suspect 'interested in Isis': police". The Local. 9 April 2017. Archived from the original on 6 May 2017. Retrieved 10 April 2017. ^ a b Chan, Sewell (14 April 2017). "Suspect in Stockholm Attack Was an ISIS Recruit, Uzbek Official Says". The New York Times. Archived from the original on 15 April 2017. Retrieved 14 April 2017. ^ "New details about 39-year-old terror suspect". Radio Sveriges. Retrieved 10 April 2017. ^ "Stockholm attack suspect 'exchanged Whatsapp messages with Isis supporter before and after rampage'". The Independent. 10 April 2017. Archived from the original on 23 May 2017. Retrieved 10 April 2017. ^ "Uppgifter om terrorist-chatt tillbakavisas". Dagens Nyheter. 10 April 2017. ^ "Suspect in Stockholm truck attack admits terrorist crime". Reuters. 11 April 2017. Archived from the original on 19 April 2017. Retrieved 11 April 2017. A Facebook page appearing to belong to him showed he was following a group called "Friends of Libya and Syria", dedicated to exposing "terrorism of the imperialistic financial capitals" of the United States, Britain and Arab "dictatorships". ^ "Stockholm terror suspect subject of racial agitation investigation". 6 July 2017. Retrieved 17 September 2017. ^ "Förundersökning mot Akilov om hets mot folkgrupp läggs ner". Expressen (in Swedish). Retrieved 20 September 2017. ^ "Islamistisk organisation uppmanar muslimer att inte rösta". DN.SE (in Swedish). 20 August 2018. Retrieved 22 August 2018. ^ "Application for a detention order in terrorist case". Swedish Prosecution Authority. 10 April 2017. ^ "Rakhmat Akilov ville byta bort advokaten". Expressen (in Swedish). 10 April 2017. Archived from the original on 6 May 2017. Retrieved 11 April 2017. ^ Anderson, Christina (11 April 2017). "Stockholm Attack Suspect Will Plead Guilty, His Lawyer Says". The New York Times. ISSN 0362-4331. Retrieved 13 April 2017. ^ "Stockholm terror suspect was mentally fit at time of attack, doctors judge". 10 May 2017. Retrieved 20 September 2017. ^ "Invitation to a press conference – prosecution for terrorist crimes in Stockholm". www.aklagare.se. 23 January 2018. Retrieved 25 January 2018. ^ "Stockholm terror suspect Akilov formally charged". DN.SE. 30 January 2018. Retrieved 30 January 2018. ^ It is very common for Swedish life sentences to be commuted through acts of clemency, thus reducing the sentence to a set number of years. See Life imprisonment in Sweden. ^ "Rakhmat Akilov överklagar inte domen". Dagens Nyheter. 11 June 2018. Retrieved 11 June 2018. ^ Svahn, Clas (8 June 2018). "Om tio år kan Akilov begära tidsbestämt straff". Dagens Nyheter. Retrieved 11 June 2018. ^ Nyheter, SVT (9 August 2018). "Akilov attackerad av gängkriminell inne på Kumlabunkern". SVT Nyheter (in Swedish). Retrieved 9 August 2018. ^ "Attack in central Stockholm: 4 dead – explosives found in lorry". Aftonbladet. Retrieved 9 April 2017. ^ "Tidslinje över dådet i Stockholm – Nyheter (Ekot)" (in Swedish). Sveriges Radio. Archived from the original on 9 April 2017. Retrieved 10 April 2017. ^ Polisen. "2017-04-07 14:53, Kontroll person/fordon, Stockholm". Polisen.se (in Swedish). Archived from the original on 10 April 2017. Retrieved 9 April 2017. ^ a b Polisen. "Två anhållna för terrorbrott". Polisen.se (in Swedish). Archived from the original on 29 April 2017. Retrieved 10 April 2017. ^ Swedish Prosecution Authority. "Arrest revoked in terrorist case". Aklagare.se. Retrieved 11 April 2017. ^ Polisen (13 April 2017). "Fortsatta arbetet i terrorutredningen". Polisen.se (in Swedish). Retrieved 22 June 2017. ^ Polisen. "En person anhållen i utredningen kring dådet på Drottninggatan". Polisen.se (in Swedish). Archived from the original on 24 April 2017. Retrieved 24 April 2017. ^ "Police charge second suspect for Stockholm attack". Sveriges Radio. Archived from the original on 19 May 2017. Retrieved 24 April 2017. ^ Swedish Prosecution Authority. "Den anhållna personen i utredningen kring dådet på Drottninggatan släppt". Aklagare.se (in Swedish). Archived from the original on 26 April 2017. Retrieved 26 April 2017. ^ "Spotify Executive Chris Bevington Dies in Stockholm Attack". Variety. 9 April 2017. Archived from the original on 21 April 2017. Retrieved 10 April 2017. ^ "Belgian psychologist who worked with failed asylum seekers among Stockholm terror victims". Daily Telegraph. 10 April 2017. Archived from the original on 11 April 2017. Retrieved 10 April 2017. ^ Hvittfeldt, Elisabet (11 April 2017). "Lena, 69, dödades i terrorattacken". Bohusläningen (in Swedish). Retrieved 11 April 2017. ^ "Föräldrarna till döda Ebba: "Av hela vårt hjärta tackar vi det svenska folket"". TV4 (in Swedish). Retrieved 11 April 2017. ^ Nyheter, SVT. "Politiker från Trollhättan död efter terrorattacken". svt.se (in Swedish). Archived from the original on 28 April 2017. Retrieved 28 April 2017. ^ "Pressmeddelande: Bekräftade uppgifter om drabbade av händelsen i centrala Stockholm". www.sll.se (in Swedish). 7 April 2017. Archived from the original on 1 May 2017. Retrieved 28 April 2017. ^ "Gravvandalen gripen igen – efter internationell polisinsats". Mitt i Stockholm (in Swedish). Retrieved 11 April 2019.